I had swore off any more pirate reviews for awhile. God knows, it seems like I've been doing one every other night. Looking back, I've only done 2 in the past 10 reviews, but it seems like a whole lot more to me. 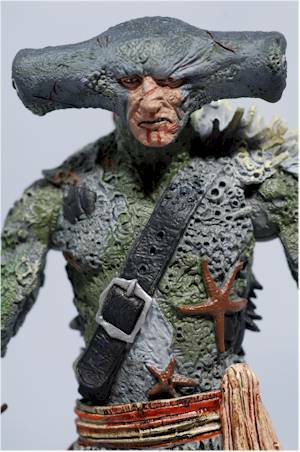 But we've all been wondering about the first series of figures based on the new film from NECA. With two of the most visually interesting characters in Davy Jones and Maccus, it is likely to be a series that many folks consider picking up. And since it's just starting to ship, I thought I better let readers know how it turned out. 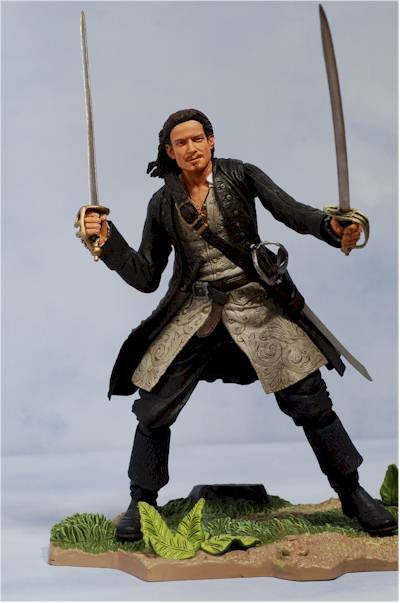 There are four figures altogether in this set, with another Jack Sparrow and Will Turner. 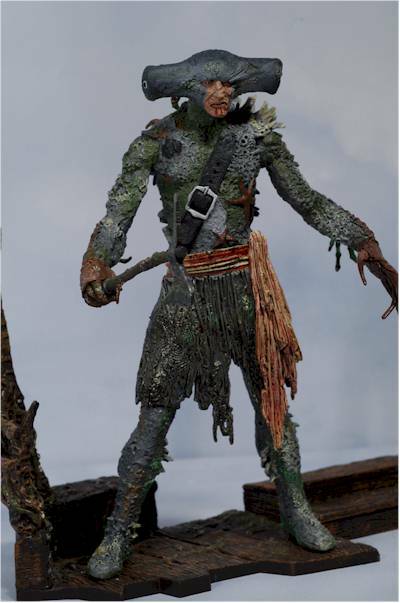 NECA is going with the build-a-diorama concept again with the Dead Man's Chest figures, and buy picking up the figures in series 1 and 2 you'll end up with two complete scenes. One is on the deck of Jone's ship, and the other is in the jungle. You may find these at Spencers, but your best bet is really online at this point. Expect to pay around $11 - $12 each. 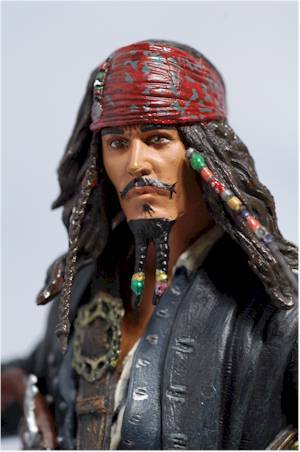 Series 2 will include ANOTHER Jack, Palifico, Boot Strap Bill, and Elizabeth Swann in her pirate outfit. It's scheduled to hit in September. Clamshells, movie logo, the usual. While I like the general look of the insert, I have to admit that it's starting to seriously bore me. There's some slight changes, but a bigger shift with the new film would have been nice to differentiate the series better. 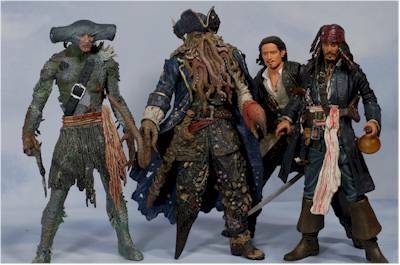 The saving grace is the inclusion of the pirate style map that shows how to lay out the two dioramas with the various base pieces included with each figure. Thank you! When it comes to pure sculpt, Davy is my hands down favorite of this series. Not that it's surprising, considering how cool the design is to begin with, but it's nice to see NECA meet expectations. 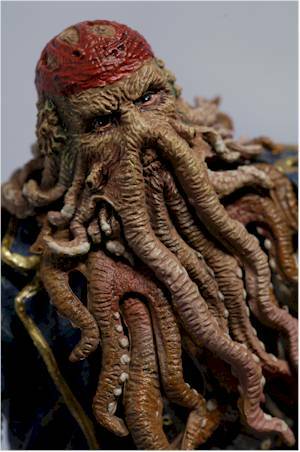 The slithering octopus beard melds beautifully with the face and head, with little suction cups and excellent texturing. His entire body is covered with barnacles, moss, algae, and coral, so much so that he looks like his own personal reef. His hands work well with the cane, and he stands great on his own. The soft rubber coat is actually not glued to the left shoulder, but is formed in such a way as to stay in place. This means you can get to the arm to pose it a little better however. 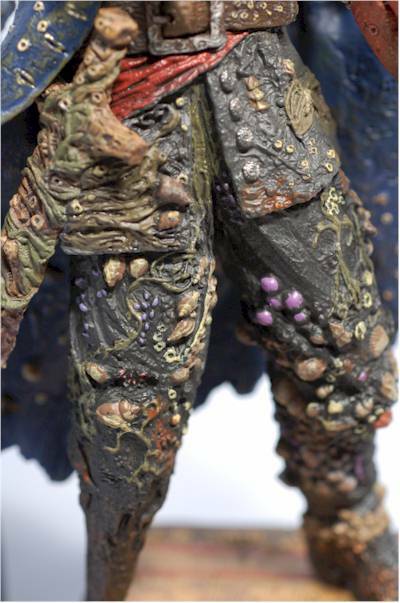 Maccus has another amazing sculpt, with plenty of reef qualities himself. 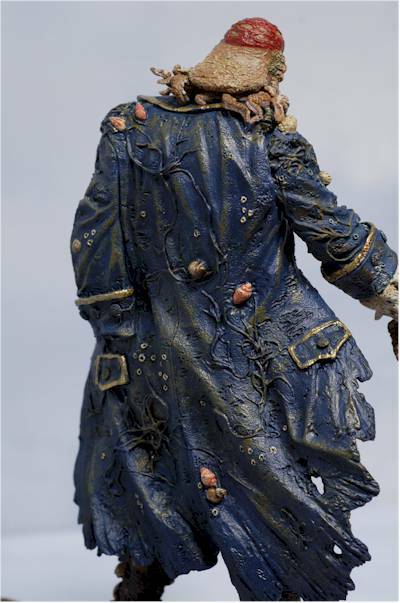 I love the small touches like the small crab legs on his back or funky coral growing off his shoulder. And while he has human eyes on the front of his shark head, he appears to also have shark eyes on either side. These two characters look like far worse results of a teleporting accident than Brundle-fly ever was. Then there's Jack and Will. Will has a dynamic pose, designed to look good in battle in the jungle. He stands great on his own, and he sports more amazing detail, especially in his light colored long vest under his coat. 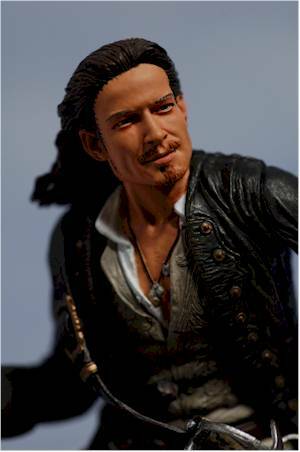 The head sculpt is handsome and well defined, but I'm not quite seeing Orlando in there. Or even Will, for that matter. He's got the right facial hair in the right places, but he looks a little too generic. Obviously capturing Orlando Bloom is no easy task. Jack is...well...Jack. We've seen this figure several times already, and we're going to see him several more. I can't really complain about this particular sculpt since it is an excellent likeness, but he's going to take a hit for being on my shelf multiple times with almost no change. There is a little change here. He has another belt this time around, and they've added some additional trinkets and such to his belt, including what appears to be a shriveled monkey's paw...interesting. He has the compass permanently attached again, and the same rag/hat combo for his head. All the details we've seen before are included, like his rings, beads and wrist band. However, a reader pointed something out to me that I had never noticed, and now (damn it!) I can't not notice. His arms are so thin! And I'm not talking about thin in a I'm Johnny Depp not Arnold Schwarzenegger kind of way, but in a inhuman, weird, odd looking way. The problem is that when you realize that these arms are in a heavy jacket, you realize that they simply aren't in proportion to the rest of his body. Not even close. And now that's going to bug me all day. The paint on all four of these figures is solid, with a couple minor nits. There's little to no slop, and the definition between colors is quite clean and good when appropriate. More importantly for an NECA release, there's no over done dry brushing or ridiculously heavy washes. They've used enough to highlight detail without producing any powdered donuts. Small detail work is great, which is fairly critical across the board. There's so many small shells, barnacles and growths on Maccus and Davy that getting it perfect was crucial, and they did a mighty fine job. The eye work on my Maccus is slightly off though, with one eye looking a tad wonky. He also has somewhat of a 'toy' appearance, rather than the realistic appearance that we see with Davy, but that might be partly due to a more consistent palette. His colors tend to blend in a little too much with each other, giving him less pop. Davy is easily the best, with almost zero flaws. Will and Jack are both clean and neat, but both also suffer from more gloss on the face than you're used to with this line. It's a minor nit, and the lack of variation with Jack also bugs me. Hey, give me something in the paint to tell these guys apart if nothing else! Jack has his usual articulation. The best is his ball jointed neck of course, with a decent range of movement, but he also has NECA ball jointed shoulders (which have less range of movement than some others), cut wrists, cut waist, cut boot tops, and cuts at the top of the jacket cuffs. Will is stuck in a more dynamic action pose, but lacks the ball jointed neck. His is just a cut joint (although it appears as though it SHOULD be a ball joint), along with ball jointed shoulders, cut wrists, cut waist, and cut boot tops. Will's biggest issues lie in his arm articulation. He has nothing for the elbows, and his wonky NECA shoulders look odd at any position except one, since they cause the coat to line up funny. Maccus is pretty much a statue. He does have a ball jointed neck, but the movement is very restricted. He has ball jointed shoulders, but again, the design allows for very little movement. He finishes up with a cut waist and cut wrists. His posing is definitely limited. Davy has the least amount of articulation of the bunch, but considering his bizarre design I wasn't too surprised. There's a neck joint, but that beard of his reduces the movement quite a bit. He has the same NECA shoulders, again with limited movement. It's worth nothing though that the soft rubber coat moves freely on the left shoulder, so it doesn't impact the arm. He sports a cut waist, and one cut boot top for leg articulation. It's enough to get him into the sweet spot and stay standing. His saving grace is the bendy tentacle 'finger' on his left hand, and the articulated claw on his right. Both are nice touches, and add to the posability of a figure that would otherwise be nothing but a statue. I really do wish though that the wrist on the claw hand had been a cut joint. It wouldn't have hurt the appearance of the sculpt, and it would have really added to what you can do with his pincher. 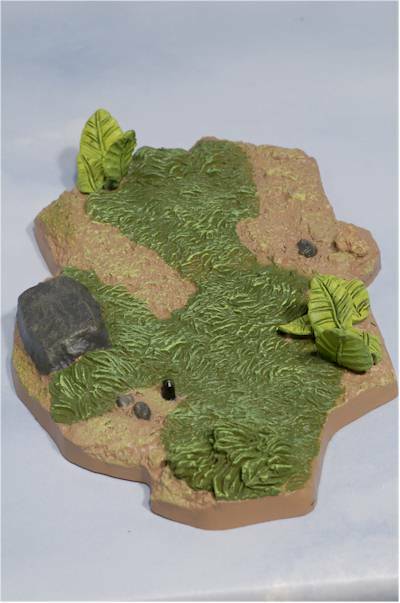 There's some reuse across the accessories, but it's really the diorama bases that will interest most folks the most. Will and Jack actually do the best here, simply for sheer numbers. Will comes with not one but three swords, all with different hilts. That leaves two for his hands and one for his scabbard, which can also be removed quite easily. He also has a knife that fits in an additional sheath on his belt. Mine doesn't fit down as far as it should though, and the sheath is blocked by design or glue. His base is a chunk of the jungle scene. He's the only one of this series to be part of the jungle scene, so I threw in a photo of his base just special. It has a nice design with solid sculpting, including some low growing jungle plants. I couldn't actually get him to use the pegs though, as his foot hole was too small. As I mentioned earlier, he stands great on his own though, so it's somewhat irrelevant. 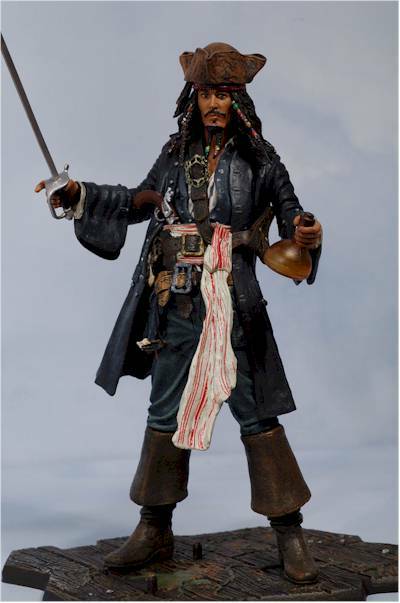 Jack has some reused accessories, including his hat, sword, flintlock pistol and bottle of rum. The sword fits easily in his scabbard, and the gun fits inside his main belt. You might have to dink around with it a bit though before it finds its way all the way through. He has a single piece base, and it's the least exciting section. Maccus' base is in two parts, and you should reference the little map to see how the stairs align. 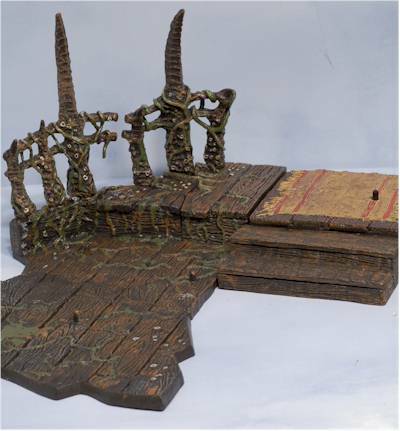 The deck is well sculpted and looks good, particularly once all the pieces are in place (or at least the three sections that come with this set). Maccus has but one accessory (other than the base section) - his axe. Just like him, it's covered in barnacles and crud. It's made from a very soft plastic, so take care inserting it in his hand. His base section is also in two pieces, and includes a nifty soft rubber tentacle like railing. Davy has some more of that 'tentacle railing' you attach to his base, and his is also in two pieces. One section is where the stairs lead and he stands, above the rest of the diorama. His foot peg fits well, but you really don't need it either. He also has his soft rubber hat, and a hard plastic cane. I would have liked to at least have had his key included, to wear around his neck or tease Davy. You'll need Palifico and Bootstrap Bill from Series 2 to finish off the deck scene, but considering that of the five pieces, only Jack is dull (and could be skipped, if you ask me), then this diorama is a pretty good deal. Unfortunately, the jungle scene doesn't work out quite as well. You'll need another Jack, this one from series 2, this Will, and one of the Pirate Elizabeth's. That's a diorama I don't expect to see completed in a lot of displays. I'm not sure I'd call these 'fun', and most kids in the eight and under set are better served by the Zizzle product. But the adult collectors will appreciate the addition of Davy and Maccus, and you have to admit that dioramas are always cool. I'm assuming you pay around $12 each for this, the usual going rate in singles. That's a reasonably decent deal, especially considering how dry the market is right now. If you do find these closer to $11 or even $10, you can add another half star. You'll want to take plenty of care putting the accessories in their hands. It would be quite easy to snap the swords or damage the thumbs. Also, the tentacle finger on Davy seems tenous at best, and mine is already about to fall off. Take care with where it attachs to the hand when you're bending it around. Finally, when you place the gun in Jack's belt, it will be long enough to run into the new second belt. Be sure to place it under the belt as you insert it, otherwise you could damage the belt on impact. Davy is easily my favorite of the set, and I'm not in the least bit surprised by that. I've loved the design since I first saw it at last year's SDCC, and he's going to make a great big screen big bad. 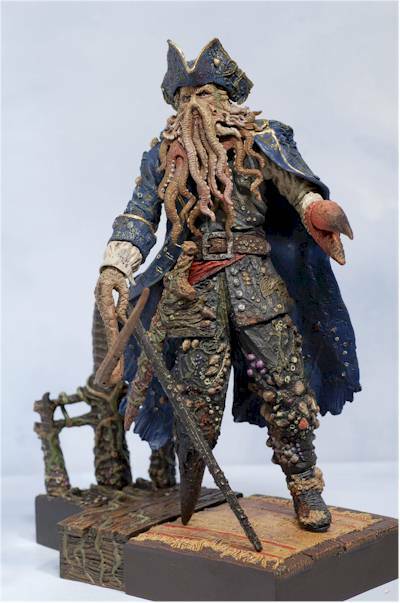 There's a ton of detail work in his sculpt and paint, and the beard of tentacles is quite impressive. Even with the wonky design, they managed to make a figure that can stand on it's own as well. 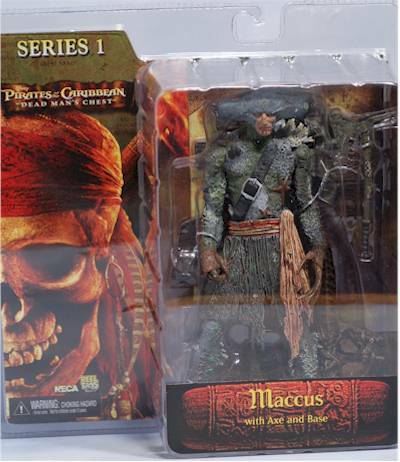 Maccus is solid as well, and will make a great addition to the display. I love the sculpt detail and paint ops, but the lack of accessories and poor articulation hurt him a little more than Davy. Will is actually a pretty dynamic looking figure. If you're going to skip the articulation, going with this style of dynamic pose can work well. I'm not real fond of the 'action hair', but you can get him posed in such a way to make it look alright. 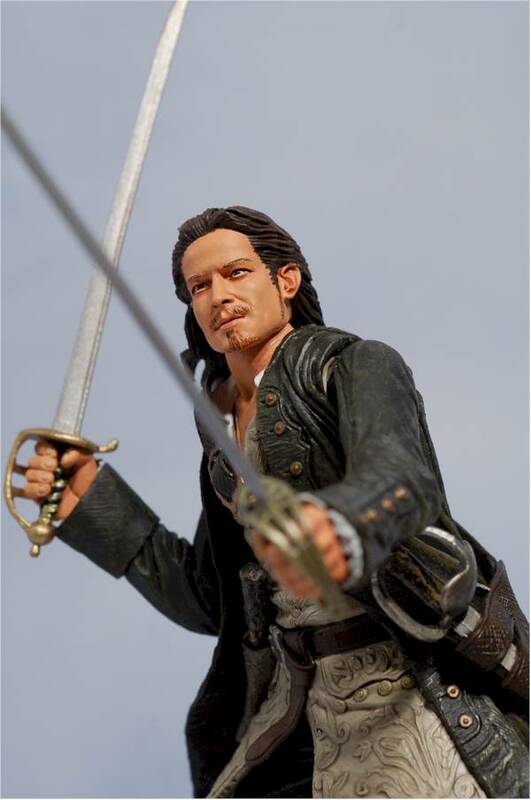 The big gripe continues to be in capturing Will Turner, or Orlando Bloom as Will Turner. While this is a fine looking pirate, he could as easily be Errol Flynn as Captain Blood. Finally, there's Jack. This is the fourth wave of figures for the two films that has included Jack, and he's been almost identical every time. 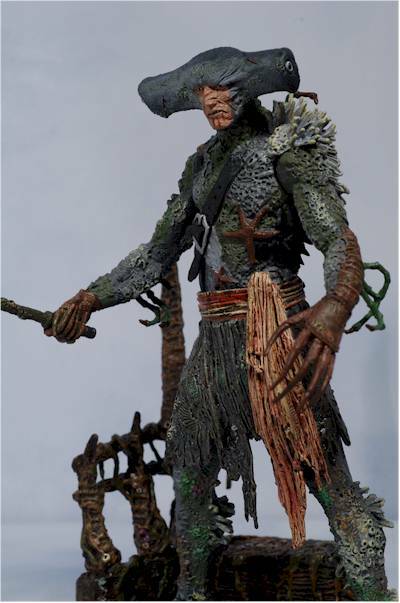 On top of that, it looks like we'll be getting pretty much the same sculpt in the second series of Dead Man's Chest. Now, I fully understand that NECA is doing everything they can to get as much out of this line as possible. With the current retail scene and the cost of a high visibility license like this, I'm sure cutting costs was the name of the game. On top of that, it's not like Jack wears 5 different outfits - he looks pretty much the same through out. If this Jack and the next were unimportant, I'd mind less, since you could simply skip them. But since you need their bases to complete the dioramas, you're stuck buying two more Jacks. At least we could get the extra eyes painted on his face, or a new pose. Throw us a bone here! - CornerStoreComics has the Jack for $10, the other individuals for $12, or the set of four for $44. - Amazing Toyz has them for $12 each, or $45 for the set. - I just recently reviewed the new cursed boxed set of Jack and Barbossa. - there's a guest review of Elizabeth Swann and my review of the second cursed Pirate, as well as my review of Pintel at Movie Poop Shoot, and Regatti here. 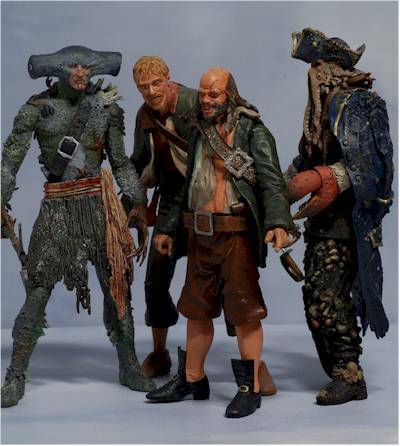 - NECA did a full first series, including Barossa, Turner, Sparrow and a dead Pirate. - they also did a terrific 18" version of Sparrow. - Zizzle's line of 3 3/4" has gotten a review of some of the figures, along with a guest review of the Isla Cruces set. - Disney just released some figures based on the actual park attraction, and not the film. 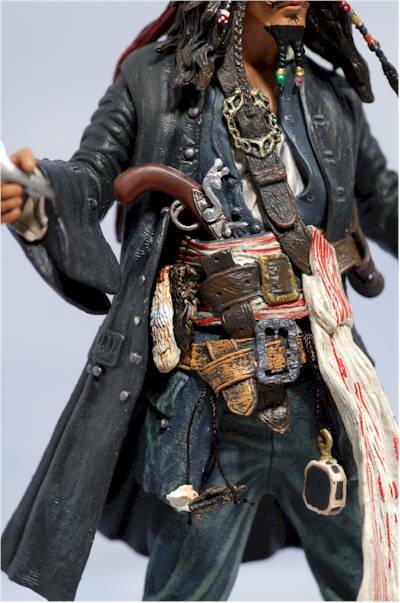 - Mezco recently released some very cool Pirate Mez-itz, not based on any license, but cool nonetheless. 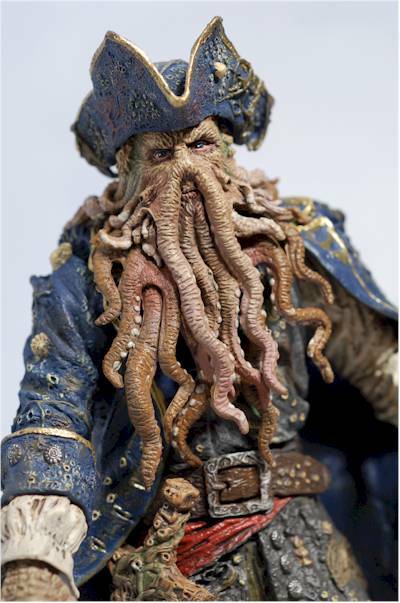 - and if you like your pirates a little more 'real', there's always Blackbeard from Sideshow.